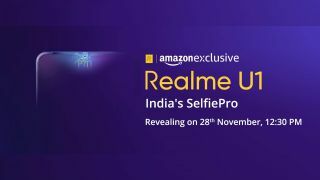 Realme is set to launch the U1 with Helio P70 in India on November 28. While the company is busy teasing their upcoming smartphone, a leaked image revealing AnTuTu benchmark scores of the phone has surfaced online. First spotted by Smartprix, the image shows AnTuTu benchmark app running live on Realme U1, Redmi Note 6 Pro and Honor 8X. In the image, we can clearly see three phone kept side by side with their benchmark ratings. Although there’s no mention of the Realme U1, the model number RMX1833 can be seen in the image. Based on previously leaked Geekbench listing, RMX1833 is the upcoming U1. We already know that the Realme U1 will feature the Helio P70, the new 12nm chipset that is claimed to be more powerful and well-optimized upgrade to the Helio P60. It is said to bump up the speed by 13%, improve graphics performance and enhance AI capabilities by 30%. Before we could test the performance in real, we might have an idea of how it stands against the Snapdragon 636 (Redmi Note 6 Pro) and Kirin 710 (Honor 8X). The image shows that the Realme U1 (RMX1833) scores 145021 on AnTuTu and beats Redmi Note 6 Pro and Honor 8X (JSN-AL00a) by a significant difference. We do not confirm the authenticity of the leak, but previous leaks from the source have been on point. Still, we would advise you not to assume it to be a better performing phone than the other two in the picture. Let’s wait for the launch and find out what it has in store for us.